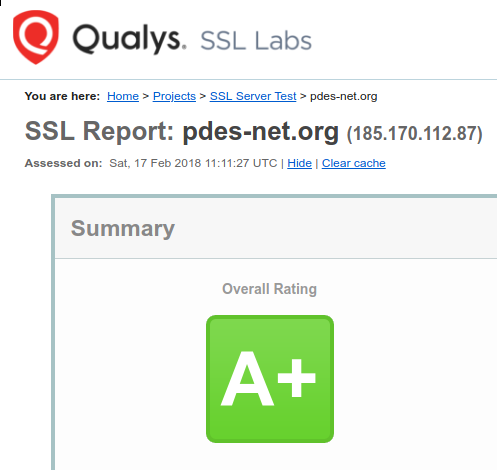 Ever since I've set up the new server for this blog, I've wanted to make the switch from plain HTTP to TLS-encrypted HTTPS (if you think HTTPS is for online shops and banks only, think again). This transition turned out to be much easier than I thought. Hiawatha, our web server of choice, comes with a script that takes care of registering the site at Let's Encrypt and requesting certificates for the associated domain(s). Chris Wadge, the maintainer of Hiawatha for Debian, provided an excellent tutorial guiding through the few steps necessary to configure Hiawatha for serving HTTPS content. Since I had to configure vhosts for the certificates anyway, I took the opportunity to set up some proper subdomains. For example, this blog can now be reached at https://cobra.pdes-net.org.